Melissa Hillman leaves Shakespeare's "pulp" play largely intact. The carnage in this play is uniquely brutal. 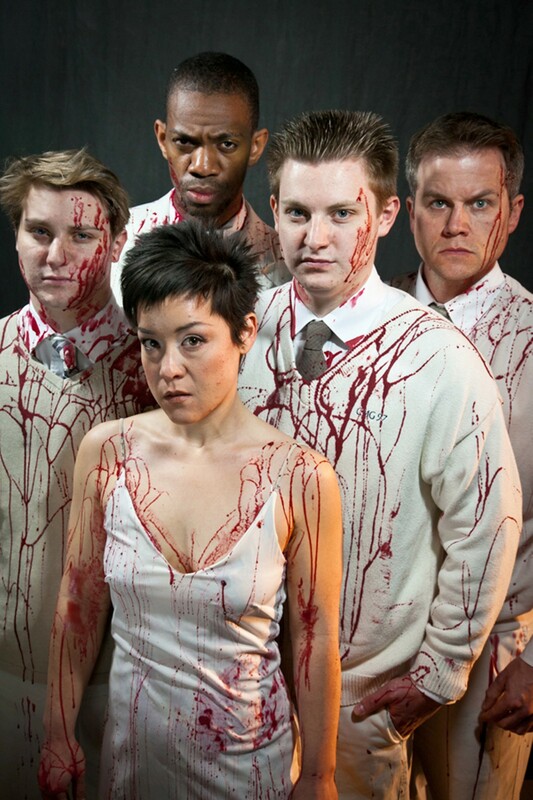 Few plays are as risky as Titus Andronicus, the Shakesperean bloodfest that was considered a cheap thrill even in its time. It's fallen back in favor in the Bay Area, with recent productions at Cal Shakes and, now, Impact Theatre, the tiny basement company that specializes in contemporary renditions of the classics — although this Titus seems remarkably unadulterated. Director Melissa Hillman opted for a dry, spare palette to contrast the violence and richness of the language. It was a shrewd decision. Her version of the play is unsettling rather than garish, and psychological rather than barbaric. That's no small feat when you consider that Titus is just a hairsbreadth from being an Elizabethan slasher play (Salon critic Charles Taylor dubbed it "pulp"). Although mass carnage is the mark of any tragedy, this one is uniquely brutal: hands get mutilated; a tongue is chopped off; a woman is gang-raped; there's even a meat-pie scene to anticipate the ones in Sweeney Todd. The conventional wisdom is that Shakespeare added all those elements on purpose, because he was pandering to the increasingly bestial tastes of his audience. Yet, amid all the blood and butchery, the playwright's substantive themes still shine through. He was a playwright obsessed with loyalty, ambition, betrayal, madness, and power relations. Pulpy as it is on the surface, Titus is ultimately a political play, and it retains that aspect in the hands of an astute director. Hillman clearly saw that, and she cast the play accordingly. Stacz Sadowski plays the title character, who cedes power to Saturninus (Mike Delaney) in the opening scene. Shotgun Players actress Anna Ishida sparkles in the role of Goth Queen Tamora. She weds Saturninus strictly to take revenge on the Andronicus family. Titus' son Lucius, the warrior who will avenge the throne, is a daughter in this case, played by an appealingly androgynous Caitlyn Tella. Reggie D. White plays the Moor Aaron, supposedly the center of an evil Trifecta (he teams up with Tamora and her two sons set the revenge plot in motion). In this case, though, he's somewhat less reptilian than the other villains, and he actually becomes sympathetic toward the end. While the narrative remains largely intact, Hillman made several internal cuts to the script, mostly for the sake of avoiding redundancy and propelling the plot forward. That was her justification for excising a particularly long soliloquy by Titus' brother Marcus Andronicus (Jon Nagel) when he discovers the ravaged Lavinia (Sarah Coykendall). She also changed Aaron's fate at the end, mostly so the audience would perceive racism to be the motivation for his actions. "A 2012 Bay Area audience's reaction to racism is going to be a lot different than a Renaissance London audience's," she wrote in an email, explaining that such alterations were the only way to make Titus seem remotely "redemptive." If that and a female Lucius are Hillman's concessions to a 2012 Bay Area audience, they're certainly worthwhile. Otherwise, she mostly resists the impulse to modernize. There is, to be fair, a mock CNN broadcast in the first act, during which the three figureheads — Saturninus, Bassianus, and Marcus — all address the Roman populace and express competing plans for governance. But that's an aberration. In designing the set for Titus, Anne Kendall purposefully obfuscated the time and place. Members of the Andronicus clan wear camouflage since they're all part of a militia; the letters "SPQR" — for Senatus Populusque Romanus, or "The Senate and People of Rome" — are stenciled on a back wall. Unlike such previous experiments as the Eighties-era Midsummer Night's Dream and Russian Mafia-inspired Romeo and Juliet, Hillman chose to keep this one stripped down and ascetic. 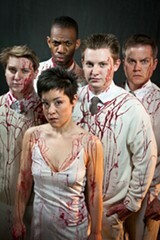 The real romance of Titus is the language, and the blood-splatter provides enough adornment for an unfurnished set. And when you hear some of the character monologues, it's hard not to fault the critics who've derided it as schlock. When Tamora describes the "barren and detested" forest with its swelling toads and "baleful mistletoe," she could easily be referring to dark and mossy caverns of her own mind. Aaron, too, makes a brilliant analogy about "Otherness" in the fourth act, when he first meets the mixed-race child he fathered with Tamora. "For all the water in the ocean/Can never turn the swan's black legs to white," he mourns, after the nurse (Cassie Rosenbrock) dubs his child a disgrace.